Running only 150-some performances on Broadway in 2004, Frank Wildhorn’s musical adaptation of Dracula has taken on a life of its own with multiple rewrites in major productions. 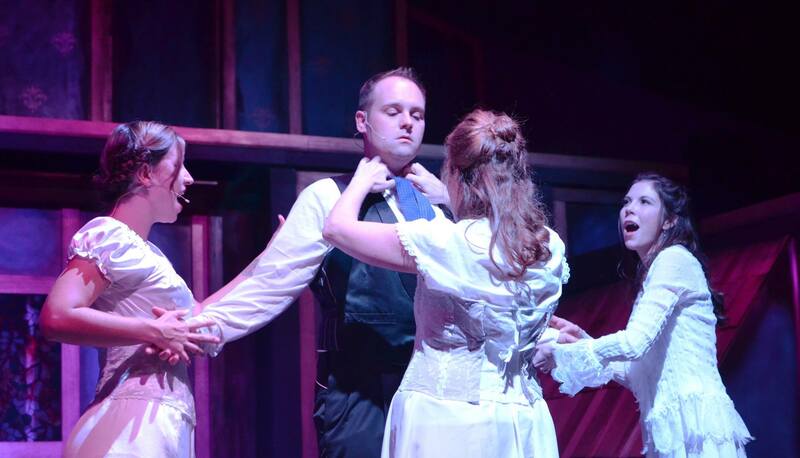 The revised (better) version is now playing at the Dio Theatre in Pinckney, and you can instantly see what attracted him to the project to begin with — a gothic romance with a rich history and plenty of material to work with. When I saw the production in NYC, it struck me as one of the most stunning scenic designs and special effects I’ve ever seen on a stage, and recall the lovely score, while at the same time wondering why there is a cowboy in the cast. New Yorker Joshua David Cavanaugh has a terrific voice and makes the most of the role of Dracula himself. Steve DeBruyne is terrific as Jonathan Harker, especially his song “Before the Summer Ends” towards the end of the show. Jared Schneider is a pitch perfect Renfield, and Andrew Gorney an assured Van Helsing. Cody Musteffe (Dr. Seward), Peter Crist (Morris) and Zak Stratton (Holmwood) are very good in their supporting roles. As to the women, always strong Mahalia Greenway is superb as Lucy, and Sarah Brown sings Mina beautifully. The trio of vampires (Dracula’s “wives” — don’t ask) are well performed by Kristin Reeves, Erin Otteman, Emily Rogers, and Lydia Adams. There’s also a child who fulfills his small part well (Gavin Burwell). The real star of this show is the luscious Wildhorn score (lyrics and book by Christopher Hampton and Don Black) and the Dio’s cast, led by musical director and orchestra conductor Tyler Driskill, sounds vocally wonderful and makes this production soar. The diction is superb, and the balance between orchestra and cast is good. Okay, there’s no flying, and Dracula doesn’t go walking across the ceiling like he did in NYC, but the very interesting set and lighting are designed by Matthew Tomich, and it rises right up to the ceiling playing out on multiple levels. Norma Polk’s many costumes are gorgeous and flow well on stage. Crosses burn, flames fly, and The Dio’s most technically ambitious show yet looks great. I commend The Dio for taking a risk and producing this little-known musical. When other local theaters are falling back on Annies and Music Mans, its a breath of musical theater heaven to have this strong score on stage here in Michigan. Ok, now, a bit on the show itself — like some of Wildhorn’s other shows, the music is far better than the material. While most of the original story of Dracula is here, its a bit convoluted — and at other points it helps to know the story well, because it makes leaps from one scene to another without the explanatory information in between. Look, lets be honest: if you are going to see a musical about Dracula, you are not going to be looking for a strong book, and you don’t find it here — the script is, well, in a word, scattered. But the music makes up for it, and Steve DeBruyne’s directing increases tension in a well-paced way. Heck, the director/producer in me wants to grab into this show and salvage the super chamber musical inside from its own overblown excesses…but this show has been rewritten enough. Suffice it to say, go for the music, stay for the story. And just scratch your head as to why there is a cowboy on stage, and let it go at that. Chef Jarod has provided a hearty and delicious meal as always, and overall, this is a pleasant way to spend a fall evening or afternoon.